On Friday January 13th (?!) I had my last in a series of 35 radiation treatments. Hopefully my golf-ball sized growth has been sent to h-e-double-hockeysticks. That we won't know for three months. The thing about those 35 treatments is that essentially some very nice people in lab jackets have been microwaving my tongue for 15 minutes every day for the last 7 weeks. And up til the end of the treatment, it wasn't that bad. Now once the treatments ended, in the perverse logic that guides the Universe of Man, all hell has broken lose, tongue-wise. And it has been getting worse each day for a week now. Of course there are ulcers. The feeling that a barbecue skewer was piercing my tongue was not a surprise, really. But nothing really prepared me for the ropey saliva. It's referenced in all the little booklets they give you, and on all the medical websites, so you know you'll have ropey saliva. But nothing spells it out in practical terms – you'll be excreting an industrial-grade drool without stop. Way beyond Homer Simpson. Your pie-hole becomes a constant rainforest-like cascade. Somewhat like the Alien movies, without the acid-eating-through-the-floor part (thank goodness). To me I feel like a sea creature. A slime-emitting sea creature. 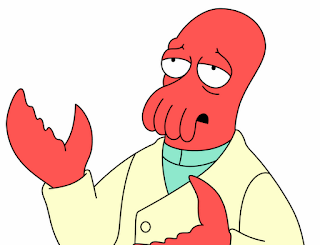 For some whimsical reason I have settled on Futurama's Dr Zoidberg. Even though I've never seen him drool, it's just something about all those facial tubes. Hopefully that will go away soon. Until then, I'm mopping up at the rate of one roll of paper towel a day. I'm reminded of this fantastic St. Bernard that I saw get walked onto the streetcar a few years ago sporting this majestic twelve inch ropey saliva precariously dangling from its right jowel. As it lumbered down the car the drool hypnotically swayed back and forth narrowly missing a number of patrons (as I sat silent and agape at the impending trainwreck) until finally the glob found its mark along the full length of some poor guy's calf. One of those, "so you're having a bad day", sort of moments. I'm sure that in no ways helps. :D. Love you my friend, let the healing begin!